To understand multiple sclerosis pain and how to find relief, we must first understand pain. This understanding will give us the tools to create comfort. Something is breaking or burning and needs our immediate attention. After an injury, to remind us not to use that part of our bodies as often or in the same way until the body has made adequate repairs and healed. Body is signaling to “stop” doing something to keep us safe (not physically but psychologically and socially). A good book to read regarding when the body says “No” is Gabor Mate’s book by that same name. 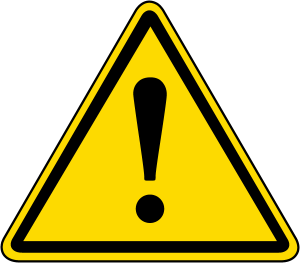 These are very important messages that alert us to a needed action or caution. The body continues to send the message of pain 20 years after the incident, and the body part has healed (or, in the case of MS pain, when the lesions are no longer active). The body sends messages of pain during normal use of that body part. Receiving pain that appears in the area of a back injury from an incident when we were younger after just a brief walk, lifting something light from the floor, or during normal activities of the body such as digesting food is not relevant. They do not inform us of a needed action or caution (unless we are trying to lift a couch, push ourselves in the gym, or have decided to rush out the door right after a large meal!). Small normal activities should not spark the need for the body to message pain. This is when pain can be considered irrelevant, and we can focus on techniques to remove pain such as mindfulness, hypnotherapy or neurolinguistic programming (NLP). Before we continue to understand what pain is and isn’t and when we can help yourself lower the signal when it’s no longer relevant, we need be cautious. When a pain persists, we want to have a medical doctor test for life-threatening illness and infection before deciding its irrelevant and finding means to reduce the signal. All hypnotherapists, including myself, will not work on reducing pain unless a doctor has already done the necessary testing to make sure the pain signal is not alerting the client to something that needs urgent medical attention. Additionally, by informing our primary care physician or pain doctor that we are using a complementary method to relieve pain, they may choose to alter medication or other treatments as we progress with our complementary treatment decreasing our dependence on pain meds. Pain is not the phenomena we think it is… There are specialized nervous system cells called nociceptor nerves cells that create the experience of pain. They are woven into all our tissues, organs, under the skin and bones. Their function is to signal when a strong stimulus is causing tissue damage by sending out a message of pain. When nerve cells are damaged as in the case of MS, nociceptors in the region can become hypersensitive or may misfire repeatedly. This causes two sensations – ongoing pain and numbness. Many time these two sensations can be experienced in the same area! Does this sound like what you are experiencing? Both of these sensations are no longer giving the brain useful information about a current injury or danger. These nociceptors are like the story about the sheep calling “wolf!” There is no longer any threat and focusing on the irrelevant pain can distract us from focusing on what is more important in our lives. (1) When a tissue of the body is broken or burning, the nociceptor nerve cells in the area of that tissue immediately send out a signal of pain. (2) Messages from nociceptors nerve cells are sent from the extremities, organs or tissue into the spinal cord through a gate. The pain signal cannot reach the brain unless it passes uninterrupted through the gate and into the spinal cord. Interestingly, there has been research that shows how a second stimulus will block the passageway of the pain signal through the gate. This is known as the gate control theory. Non-painful input, will close the “gate” to painful input, which prevents pain sensation from traveling to the central nervous system. Considered normal body functioning and ignored. Pain that accompanies (1) safe and pleasant experiences may be classified as irrelevant and never reach the brain. Natural body chemicals called endorphins (released during exercise, massage or other positive experiences) switch the pain off in these cases. Apply a pleasant pressure, coolness, warmth or other sensation in the area of the pain can prevent the pain from entering the spinal cord. If we focus on what we are grateful about and makes us happy about what we are doing at that moment rather than on worrying about the sensation of pain could communicate to the interneurons that the pain is normal body function and get ignored! 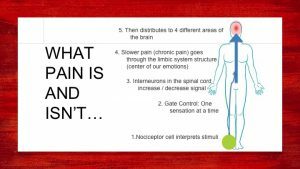 (4) Once the pain message enters the spinal cord, and the interneurons determine it’s importance, its sent up into the limbic system. Urgent pain signals travel through the spinal cord very quickly to the thalamus and directly to the cortex. All other pain, such as remittent multiple sclerosis pain, goes through a slower route from the spinal cord to the hypothalamus at heart of the limbic system structure. From there it goes through the thalamus and into several areas of the cortex (brain). the evaluative area of the brain (do we think its normal experience such as during exercise or are we interpreting as “oh no that pain will never go away!”. the sensory area of the brain (what sensation we think is happening down there where the nociceptive nerve first misfired). All these areas are areas we can influence our thoughts, attitudes, and emotions. 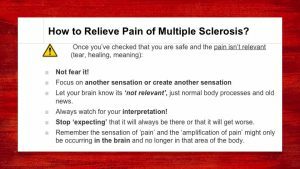 And that, in turn, affects our experience of the pain message and our ability to achieve multiple sclerosis pain relief. “Does Anticipation of Pain Affect Cortical Nociceptive Systems?” Porro et alia 2002 concluded, using fMRI scans of the brain, that up to 40% of pain is produced by the mere expectation of pain and not by “real” pain. “Psychological Factors in Chronic Pain: Evolution and Revolution” Turk and Okifuji, 2002, pp679-680 explain results of several studies showing that in chronic pain, pain-related anxiety or exposure to feared situations may accentuate the pain experience. Fearful patients appear to attend more to signals of threat and to be less able to ignore pain-related information. Thus, it’s easy to see how your emotions can override positively or negatively your perception of pain and quality of life. Hyperalgesia (pain amplification): the nervous system “learns” to be oversensitive to pain. The disruption can alter the processing in the brain so that there is abnormal activity (detectable by PET scans) in the nociceptors in the somatosensory cortex (area of the brain that registers ‘what kinesthetic sensations you believe occurred in what part of the body’). It is no longer the nociceptor cells in the original area of the injury but the nociceptor cells in the somatosensory cortex. Hypnotic suggestions can increase or decrease this abnormal. Knowing this can alert us to focusing on re-establishing the normal messages of the body and not focusing and amplifying through our attention, thoughts, and emotions messages that are no longer relevent. Unlearning the habit of focusing on pain by shifting our focus elsewhere. Focusing on other sensations in the body that are pleasant. Or in a scene or memory that is positive. Hypnosis for MS focuses on all the areas that were discussed in this presentation. This is why hypnosis can be so useful in creating multiple sclerosis pain relief. This presentation is part of the Creating Health Series. To receive the series in your inbox each month, please subscribe to our newsletter.